You are going to learn how to create two types of simple hydroponic systems. One is traditional hydroponics, and the other is called the Kratky Method. This is not only a beginner’s manual for building hydroponic systems. The setups and plans in this guide may save advanced gardeners time, energy and money as well. 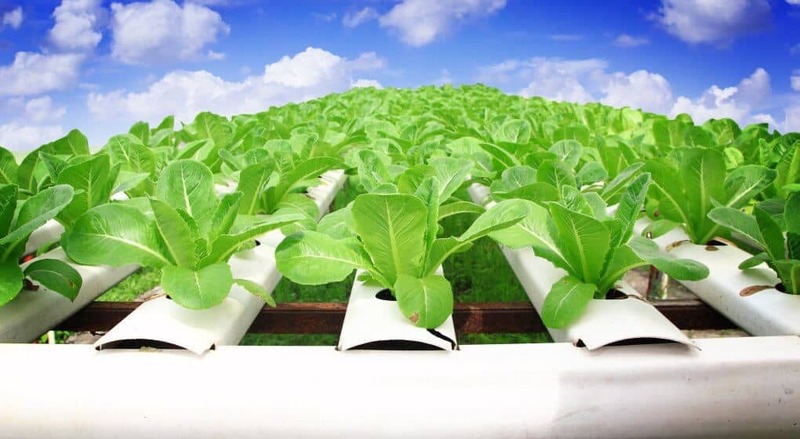 What is Hydroponic Gardening & What Are the Benefits? Simply put, hydroponic gardening is a class of methods for growing crops without soil. Now wait a minute. Doesn’t soil have essential nutrients that the plant needs to grow? Yes. In hydroponic systems, you’re replacing soil with nutrient solution formulas. In a nutshell, the solution consists of fertilizer mixed with water. Another benefit of soil is that it holds the plant in place and helps it grow in a consistent direction. In hydroponic systems, this can be taken care of with clay pellets, sawdust, coconut fiber, perlite, gravel and other substances. The most popular medium is rockwool. For more info, you can search for “hydroponics medium types” in a search engine. No need to play soil doctor. One advantage is that you don’t have any soil to test for pH balance and nutrients. Soil diagnosis is no fun, especially if you’re wondering why your plants are dying before harvest. With hydroponics, you have total control over the nutrient balance. Bigger and faster growing plants. Another benefit is that plants absorb nutrients from water solutions more efficiently than from soil. This allows them to grow more quickly and larger on average. Larger plants in smaller containers. Hydroponics causes plants to create complex and compact root systems you won’t find in potted plants. It requires less container space to grow a plant. Less water. Hydroponic systems require far less water than soil gardening. Better nutrition. You’ll get a lot more nutrients from your hydroponically grown food. Portability. Depending on how you make your system, you can move your garden around with ease. This comes in handy if you have to bring everything indoors before a frost. In such a case, you can use grow lights. Less space is required. Hydroponics is an ideal urban farming method. There is less land per capita in the cities, so many agriculturalists use their porches and rooftops as gardens. No weeding! You won’t have any competing plants stealing all the nutrients. Remember all the hours you spent in the garden pulling those darn things? Hydroponic gardens save you time. It’s cheap. You can use inexpensive household items like buckets, food storage containers, PVC pipe, cans, bottles and aquarium bubblers to grow your food. The most expensive items are grow lights if you plan on setting up indoors. Standard homemade hydroponic systems use air circulation devices to circulate nutrients and oxygen for optimum plant growth. Simple systems use net cups, containers with water and nutrient solution and simple aquarium bubblers/air pumps for air and nutrient circulation. The plant sits in the net cup, and its roots grow through it to draw nutrients from the water. The Kratky Method is a simple way to build a hydroponic gardening setup without using bubblers and other devices to circulate air. The technique simply exploits the plant’s natural desire to draw in water and nutrients with its roots. It also provides a regular supply of oxygen to the roots. Using the Kratky Method, you do not regularly change the water and nutrient mixture. The water level will go down. The plant roots will grow to keep up with the changing water level. You may notice that the plant grows as the water level decreases. A larger plant and root system requires more oxygen. Luckily, air takes advantage of the decreasing water level and displaces the water. That is the magic of the Kratky method. For beginners, the Kratky Method setup is best for leafy, non-flowering plants. However, it can fulfill almost all of your gardening needs. Required levels of vigilance vary by plant type. The best thing about a small hydroponics system is portability. Whether you’re a beginner or a hydroponics pro, you can make as many of these systems as you wish and place them in indirect sunlight outdoors, on your closet shelf, porch or desk. This is especially useful if you suspect an upcoming frost. Make a hole in the bucket lid. For starters, it should be the same size as the circumference of the smaller end of the net cup. Widen it gradually so that the net cup fits inside the hole and the top part rests on the lid. The edge at the top of the net cup should act as a stopper so the cup doesn’t fall through the lid and into the bucket. If you’re using a 10 gallon tub, it will probably hold about 8 plants with 3” net cups. You want roughly one gallon of water nutrient mixture per plant in most cases. Mark where you want the holes to be and follow the instructions for bucket lids above. Cut a small X in the lid, near the outer perimeter. This is where you will stick a bubbler tube. Imagine a straw hole in a fast food cup lid. Notice it’s not an actual hole. This provides a better grip on the straw. That’s what you’re aiming for. Stick the tube into the X. Make sure the tube is in just far enough to reach the bottom of the bucket. Attach the small bubbler to the air tube at the bottom of the bucket. Make sure your bubbler is sufficient for an eight plant, 10 gallon container, or for a large aquarium. Consult a hydroponics retailer if you’re unsure what to use for your container. Pour it in through the bucket lid hole(s) or one of the storage tub holes. Fill it high to the bottom of where the net cup(s) will be when inserted. Do not drown the roots. Let them work for their dinner. Add a plant or seedling to the net cup and drop the cup into its hole. Hopefully, you grew it in a rockwool cube already. If not, do that. You can add a stabilizing growing medium such as perlite to the net cup to keep the plant(s) growing straight if you wish. One advantage of perlite is that its pH is neutral by default. Follow the manufacturer’s instructions for those. Change your water and nutrient mixture about once per week. Empty it completely before refilling so that the balance of nutrients is completely reset. Plants will use some nutrients more than others, and this can throw off the nutrient ratio. It’s best to start with a clean slate. Important Note: Don’t drown your roots. They won’t need as much water when it’s time to refill. The instructions for a simple Kratky system are very similar to the air circulation system. You don’t need to use a bubbler or cut an X for the bubbler tube. Follow all the above instructions for the air circulation system, but skip # 2. Some plants absorb particular nutrients more quickly than other nutrients. It will leave the rest behind in the water, changing the balance of the nutrients. If you refill the water and nutrient mixture frequently, then the ratios will be thrown off. Therefore, you normally wait until the water nutrient mixture is almost empty before refilling it with more. If your container happens to be too tall, you can solve this problem by dumping the solution and adding fresh solution with the proper nutrient ratios every week or so. As previously mentioned, the dwindling water level will allow more oxygen to circulate to the roots as the plant grows. When you refill the solution, don’t bring it back up to the original level. The plant needs oxygen. Now you know how to make a small and simple hydroponic system. One way to make a larger one is to scale it up and get more containers and more of the other items. This is best if one of your biggest priorities is portability. If you’re not using the Kratky Method, you’ll probably need a lot of bubblers. For a simple design setup, use the largest containers you can find. You can buy high grade hydroponic air pumps in a hydroponics store or online. Ask the seller what you need for your container size. There are also more complex setups if you want a more efficient air circulation system with less air pumps or you have other priorities. You can find all kinds of elaborate PVC pipe plans for your gardening projects online. Bamboo is another material that is used often. The point of this homemade hydroponic guide is to give you a thorough understanding of how these systems work. That way, if you decide to make something fancy and complex, the world will become your oyster. You can focus on design instead of getting bogged down with the basics of DIY hydroponic systems and plans. Did we reach that goal? Please let us know. This step by step DIY manual should get you started with your very own cheap and high quality hydroponic garden. You have now graduated. You are no longer a hydroponics beginner. Enjoy your garden!